CORPUS CHRISTI, TX, Nov. 2, 2017 /CNW/ - Uranium Energy Corp (NYSE American: UEC, the "Company" or "UEC") is pleased to announce that the Company has entered into a definitive Purchase Agreement (the "Agreement") with Uranerz Energy Corporation ("Uranerz"), a wholly owned subsidiary of Energy Fuels Inc., to acquire 100% of its advanced stage North Reno Creek project ("North Reno Creek" or the "Project") located immediately adjacent to and within UEC's existing Reno Creek Project permitting boundary in the Powder River Basin, Wyoming (see Figure 1 below). The North Reno Creek leases and claims acquired through the transaction consolidate UEC's land and resource position in the region. Addition of North Reno Creek adds further scale to an already large, fully permitted, and construction ready ISR project located in the United States. North Reno Creek falls within UEC's existing permitting boundary at Reno Creek, allowing for integrated development. 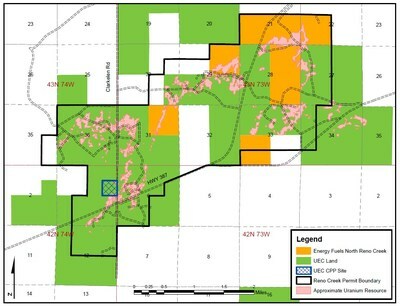 Opportunities to enhance UEC's development of Reno Creek by optimizing the mine plan to remove the effects of property boundaries that had previously separated mineralized roll-fronts on both properties. In particular, significant synergies exist in co-development at both the North Reno Creek Resource Unit and the Southwest Reno Creek Resource Unit, which are expected to be the first units developed within the project area. Further augments UEC's footprint in the strategic Powder River Basin in Wyoming, a uranium mining-friendly state with excellent infrastructure and an experienced labor force. Amir Adnani, President & CEO, stated: "We believe this transaction creates excellent value for our shareholders. The acquisition of North Reno Creek removes previous property boundary constraints, which historically prevented previous owners from realizing the full potential of this uranium district. We expect to realize significant project synergies in the consolidated development of Reno Creek, which will be reflected in a new and optimized pre-feasibility study ("PFS") which is expected to be completed by UEC next year. ** Development of this strategically important ISR asset can now move forward in the most efficient manner - as a single combined project, with shared infrastructure, processing and operating facilities." $2,450,000 in common shares of UEC (each, a "UEC Share"), with the number of UEC Shares to be calculated based on a deemed issuance price per UEC Share based on the volume weighted average price of UEC's common shares on the NYSE American for the five trading days immediately prior to (but not including) the closing date of the Agreement. Substantial historical exploration, development and project permitting were performed on the North Reno Creek property. Beginning in the late 1960s and continuing into the mid-1980s, Rocky Mountain Energy ("RME"), a wholly owned subsidiary of the Union Pacific Railroad, drilled more than 800 exploration drill holes on the North Reno Creek property. In the late 1970s and early 1980s, RME successfully operated and restored and reclaimed a uranium ISR pilot plant. Subsequently, RME nearly completed permitting and licensing for a commercial scale ISR facility. In 1992, the Reno Creek Project was acquired by Energy Fuels, Inc. (EFI) from RME. Over the next decade EFI and its successor, International Uranium Corporation (now Denison Mines), continued to advance the project toward full permitting and licensing. Subsequently, Rio Algom and Power Resources held the project until dropping all of their interests in 2003. Between 2006 and 2008, Uranerz acquired mineral and surface land interests covering approximately 1280 acres of fee mineral leases and federal mining claims comprising the North Reno Creek Project. Upon the closing of the transaction the Company plans to complete a new and optimized PFS based substantially on the information provided in its current and to be updated technical reports. Accordingly, the current PFS cannot be relied upon and should not be construed to reflect a current PFS in accordance with NI 43-101.